Welcome to our Account Based Marketing resources. Enter your info to view this content. Customers offer the trusted information that buyers value most, and their business networks are rich with potential prospects. Don’t fail to call on your customer community in your ABM strategy, or you will miss the impact that advocates can bring. 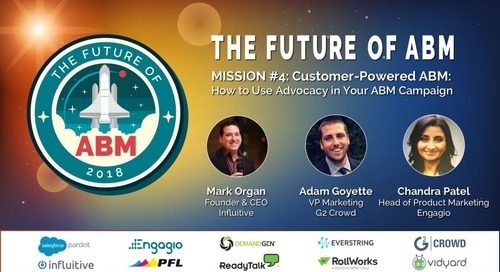 In this webinar featuring Influitive, G2 Crowd, and Engagio you'll learn how leading B2B businesses strategically source, incorporate, and align customer voices in sales and throughout the ABM funnel to increase conversion rates and accelerate deals. Mark Organ is the founder and CEO of Influitive, helping companies mobilize their advocates to produce massive increases in referral leads, reference calls, social media participation and more. Mark first revolutionized B2B marketing as the founding CEO of Eloqua (ELOQ), the world leader in marketing automation software, which was acquired by Oracle for $871M. In between, he was a go-to-market consultant for SaaS companies in North America and Asia. Mark has also helped over a dozen software companies successfully go to market in asymmetrical or disruptive ways as a consultant and entrepreneur. With an M.S. in Neuroscience from Northwestern University and a passion for understanding human psychology, Mark is a dynamic speaker with a unique vision centered not only in business success and technological innovation, but also how and why people think, act and interact the way they do. Adam Goyette leads the Growth Marketing team at G2 Crowd. He has 15+ years of experience leading teams in strategic roles focused on revenue generation, inbound marketing, demand generation, and marketing operations. Prior to his role at G2 Crowd, Adam led the Growth and Acquisition Marketing efforts at several high growth start-ups including FieldLens, Booker and JW Player. He holds a BA from the University of Maine in Journalism. When he isn’t figuring out ways to drive demand, he spends most of his time with his wife and 2 young kids, walking his dogs, or learning new photography tricks. Chandra Patel is the Head of Product Marketing at Engagio. Prior to her role at Engagio, Chandra spent the previous five years in marketing leadership roles for a number of early stage and growth B2B SaaS companies in Silicon Valley. Prior to that, she designed and launched consumer and small business digital experiences as a product lead and head of the Innovation team in the Digital Channels Group at Wells Fargo. She began her career as a management consultant for Arthur D. Little and has a B.S. in Chemical Engineering from the Massachusetts Institute of Technology and an MBA from the University of Michigan. Check out our webinar series space flight program! 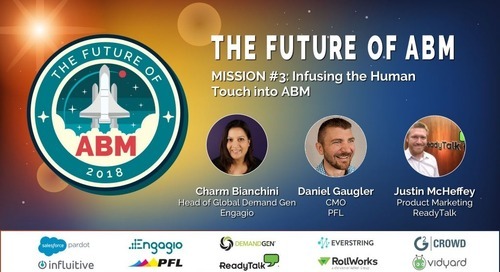 This webinar is Mission 4 of the Future of ABM 5-part webinar series where we discuss the new trends shaping the future of ABM! This series features thought leaders who will help you stay ahead of the ABM curve and give you tips to enable the 1:1 reality. Click here to find out more about the series. Subscribe to the best Account Based Marketing Blog today! It's here!!! The second edition of Engagio’s Clear and Complete Guide to Account Based Marketing incorporates everything we’ve learned over the last three years about ABM. If there was one golden rule for any revenue team to follow it would be this: Silos don’t work. It's time to break down the barriers and align as one revenue team. Selecting the right target accounts for your ABM program is the most important piece of your strategy. Done right, this will make everything else easier. Here's your guide to account selection. Engagio is an Account Based Marketing Platform. We Orchestrate Quality Growth at Scale. We help B2B marketers Understand, Act, and Measure. Our platform Grows With You as your business evolves. Leveraged properly, account-specific insights will have a dramatic impact on every engagement. Use this worksheet as a checklist when you’re running your ABM programs. ABM is no longer optional – it’s a core element of a B2B go-to-market plan for those organizations looking to drive efficiency and close larger deals. Follow these 7 steps for ABM success. Research-based research and insights that organizations can use to adopt or evolve your account based strategy for 2019 and beyond. With 7,000+ marketing technologies available, purchasing ABM it can be daunting. In this ebook, we'll set the record straight to help you make your decision much easier. In this ebook, we give you the keys to accomplishing just that. We walk you through the frameworks we use, offer some practical tactics, then end by revealing some of our plays along with the results. How do you get started with ABM? What people, processes, and technologies will you need along the way? Use our ABM Maturity Model to begin your ABM journey on the right path. Izabella Bray is changing the conversation at Dialpad, and now they're speaking the language of modern B2B teams. Be the conversation changer within your organization with Engagio. In this presentation by Craig Rosenberg, Chief Analyst at TOPO, he covers recent TOPO findings, an account-based strategy overview, key activities for successful execution, and top ABM takeaways. This report from ITSMA and the ABM Leadership Alliance provides an essential review of the current state of play with ABM. Engagio's Clear & Complete Guide to ABM Analytics is a designed to help B2B marketers understand everything they need to know about B2B Marketing analytics. There are too many compelling reasons to not take ABM seriously. This report reveals the current state of ABM, why executives should care, and how to manage the change when making the transition. Are you ready to change the conversation? In this presentation we introduce NEW Engagement Minute Attribution powered by Engagio Dash to demonstrate what true Sales & Marketing activity attribution looks like for generating revenue. Dig into what’s working and what’s next for ABM tech with a dynamic panel of experts on ABM strategy, execution, and integration. © 2019 Engagio Inc. All rights reserved. Made with in San Mateo.